Festive fun in Shakespeare's England! Enjoy plenty of festive fun in Shakespeare's England with a host of seasonal activities including the chance to see Father Christmas, listen to festive plays and carol concerts, enjoy candlelit tours, craft fairs & markets and see a Royal Shakespeare Company performance of A Christmas Carol. Shakespeare's England has all the special components you need for a magical Christmas this year. Christmas markets are held in Stratford-upon-Avon on the last five Thursdays to Christmas - 23 & 30 November & 7, 14, 21 December. Visit the Shipston on-Stour Rotary Victorian evening on 1 December. The lights are switched on in Royal Leamington Spa on 19 November, in Stratford-upon-Avon on 23 November and in Kenilworth High Street on 1 December and in Warwick Road on 3 December. Visit Yuletide Fayres in Leamington every Sunday from 19 November. The Warwick Victorian Christmas Evening featuring craft stalls and traditional entertainment is on 30 November when the lights are switched on. A new traditional Victorian Christmas Market opens in Stratford-upon-Avon from 8 - 10 December with 150 stalls selling gifts, local produce, homemade crafts, handmade cakes, decorations plus traditional roast chestnuts, mulled wine, ciders, gin and Bailey's chocolate. Join in the spirit of Christmas with the sound of choirs, instrumental performances, dance displays, stilt walkers, a Victorian carousel and barrel organ music. This winter the Royal Shakespeare Company (RSC) presents the delightful comedy, Twelfth Night, featuring Adrian Edmondson as Malvolio and Kara Tointon as Olivia from 2 November - 24 February and a new stage adaptation by David Edgar of Dickens' seasonal classic, A Christmas Carol from 27 November - 4 February with Phil Davis as Scrooge. Both plays run in the Royal Shakespeare Theatre. Shakespeare's New Place will be transformed into a magical winter dance-circus extravaganza from 13 - 17 December. Midwinter Magic Dance-Circus Spectacular will see performers from award-winning dance-circus company, Motionhouse bring New Place to life through dance and acrobatics inspired by timeless themes of Shakespeare's work. Midwinter Magic is a visual and physical feast with pure skill, spectacle and magical storytelling - a truly immersive after-dark theatrical experience. the legendary Frost Phoenix and get their own Frostmakers Passport before meeting Father Christmas and solving the mystery of the missing Frost Phoenix. As part of Stratford's Victorian Christmas weekend, the Magic Alley Players will be performing traditional street theatre as they recreate a Victorian Nativity with the help of the audience who are then rewarded by a visit from a very special guest! Tickets for Magic Alley and a visit to Father Christmas must be pre-booked to avoid disappointment. The Collegiate Church of St Mary in Warwick is the setting for the annual Christmas Tree Festival, which takes place from 30 November (Warwick Town Victorian evening) until 10 December. Visitors can vote for their favourite Christmas tree and be entered in the prize draw. Admission on the Victorian evening is 50p per adult and children are free. There will be music including the ever popular Hand Bell ringing demonstration, mulled wine & mince pies plus craft stalls and gift shop selling Christmas presents. The evening will be rounded off with a short carol service at 8.45 pm. Escape the hussle and bustle of Christmas shopping and join Jasmine and the Community Harps on 3 December for carols at Stratford Butterfly Farm at 1.30pm. There will be a craft session at 11am where children can make percussion instruments and accompany the harp playing. The popular 'Meet the Minibeast' handling sessions return twice daily from 27 December to 7 January. Visitors will be able to hold a variety of stick insects, African land snails, giant millipedes and even Madagascan cockroaches! Visit Stoneleigh Abbey for a Christmas Craft Fair on 26 November from 11am - 4pm. The Riding School Cafe will be serving drinks and snacks and 'Birds of all Feathers' will entertain visitors with a static Bird Display. There is free onsite parking. Take part in a Christmas Wreath Making workshop at Kenilworth Castle on 8 December and learn about the different techniques used to make a wreath. Christmas at the Castle takes place from 9 - 10 December with crafts, storytelling and the chance to meet Father Christmas. Enchanted Kenilworth takes place from 15 - 23 December in the grounds of the Castle after dark. Strings of lanterns and fairy lights will lead visitors along a garden trail into a magical wonderland with a traditional fairground, carousel and swing boats. 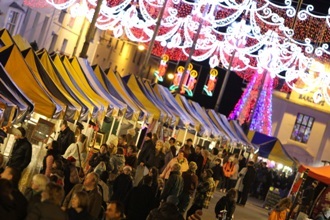 Visitors can enjoy mince pies, mulled wine and shopping at heritage-inspired stalls. Enjoy Christmas at Chedhams Yard in Wellesbourne on 16 December with carols around the wood fire plus music and traditional Fayre including cake and mince pies. Children can also meet Father Christmas and take part in activities. Open from 10am to 4pm. Free entry! Bicester Village has launched The British Collective, a multi-brand gifting boutique designed by British interior designer and illustrator Luke Edward Hall which runs until January. Discover a collection of the finest pieces, including cashmere hats and gloves, leather accessories and home wares, providing a one-stop shop for gifts for friends and family. The luxury shopping destination; currently home to 130 boutiques has now increased its fashion offering with many new brands, new dining experiences, more parking and additional entertaining and shopping services to boot. See a performance of Sleeping Beauty at The Royal Spa Centre from 2 - 31 December. Joining Spa Centre favourites JP McCue and Sean Dodds are Sally Peerless as the good fairy Gabriella, Denise Pitter as the wicked fairy Carabosse, Chloe Fay as Princess Rosa, Glyn Dilley as the King, James Leeman as Prince Victor and Teddy Moynihan as Carabosse's side kick, Fran. Tickets cost from £13.50. Watch Jack and The Beanstalk at Stratford ArtsHouse from 20 - 30 December. The pantomime will feature sensational scenery, stunning costumes, incredible special effects and plenty of audience participation. Mattie Parkinson plays Dame Trott and the sensational Clare Reilly stars as Fairy Beansprout. Tickets cost from £10. There are plenty of Christmas activities at Shakespeare's Family Homes from 2 December - 2 January each day. Meet Dickens as he walks around Shakespeare's Birthplace garden and tells the tale of acquiring the Birthplace to continue spreading the word of Shakespeare. Discover Shakespeare's family Christmas at Shakespeare's New Place. What would they have eaten, worn & how would they have celebrated? Step back in time to the 1600s at Anne Hathaway's Cottage and follow the generations of Hathaway's to discover their story and how they left their mark on the cottage. Take a step back in time to the 1930's at Hall's Croft and find out how the people celebrated Christmas in the time between two wars. Enjoy a Christmas Concert from Orchestra of the Swan at Holy Trinity Church at 7:30pm on 9 December. Stacey Watton, OOTS principal bass, will be the guest conductor for Handel's undisputed masterpiece. Tickets cost from £15.50 to £25. Enjoy a festive Jazz Sunday lunch at The Arden in Stratford on 17 December. 2-courses costs £20.50 per person or a Christmas Day lunch with Champagne & a 5-course lunch for £99 per person. Glam yourself up for the Masquerade New year's Eve celebrations with a Champagne and canapé reception, 4-course dinner, live music and dancing. Cost is £99 per person. Visit Mallory Court Country House Hotel & Spa for its Christmas Fayre on 8 December for coffee whilst you shop followed by a 2-course lunch with a glass of wine. Cost is £35 per person. Enjoy Christmas Eve Carols and a festive supper on 24 December with mince pies, mulled wine and carols from the Boy's and Men's Choir of St Mary's, Warwick followed by dinner. Cost is £35 per person.